The CoffeeShop Blog: Blogger UnWrapped: Adding Share Buttons Under Posts! Blogger UnWrapped: Adding Share Buttons Under Posts! Blogger just introduced a new gadget that adds share buttons under each post for Twitter, Blog This, Facebook, etc. So how do you go about adding these to your Blogger blog? It is so easy! 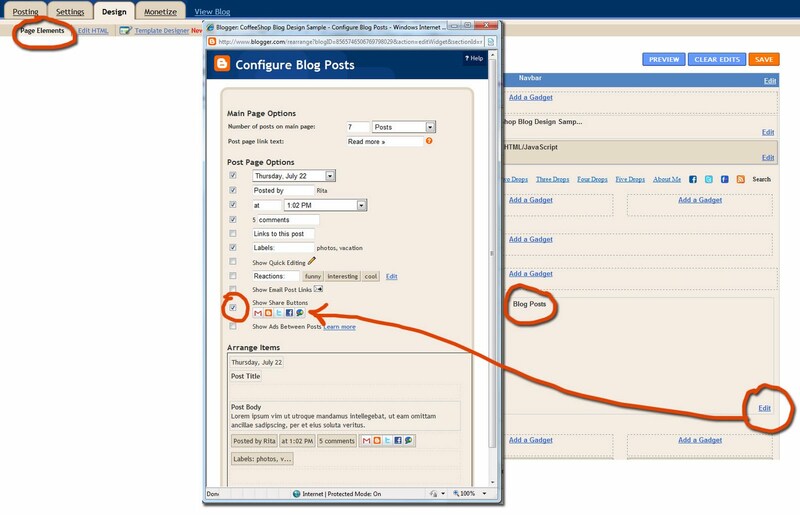 Go to Design, Page Elements and click on the Edit under Blog Posts. Then check the button by the "show share buttons" to add them. Simple! If you can't see your buttons after adding them, then you have a modified Blogger template. But with a simple addition to your template HTML (you don't have to know HTML, just how to copy and paste) you can get them to show up. Read all about it here. I also want to mention that my newest free action for Photoshop and Photoshop Elements, Perfect Portrait 2, is about to come out! 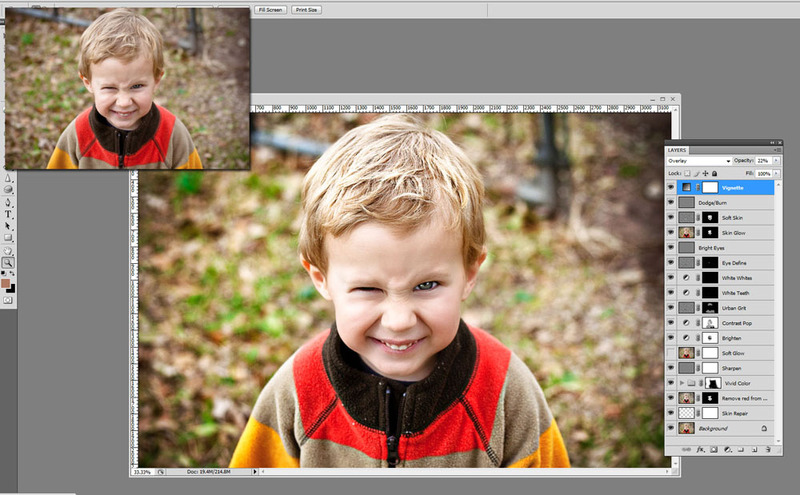 Here is a preview of this monster "one-step" portrait action. Yes, I ran the action on an image I grabbed off my desktop, so please don't laugh... Imp loves to make lovely faces. This action does it all! It includes all of the layers of PowderRoom 2 and Baby PowderRoom, with the addition of layers to pop color and contrast, add skin glow, remove red casts from skin, vignette, sharpen, etc. This action can be run on a SOOC (straight-out-of-camera) image and is my biggest and most practical action. Everything has layer masks so your edited portrait can be subtle to dramatic. Morgan has been helping me out with this one because not only is she an editing pro, but also a professional photographer with experience knowing what the pros need in a portrait action. We are trying to make sure we include detailed instructions, so that is what is holding up the release. I am also going to be posting a few more B&W actions and storyboards. go here to have a look if you like. thanks for the blogger help! I can't wait for this action!! Your Perfect Portrait + Baby Powder Room are my go to actions; total time savers! Thank you for your wonderful actions! omgosh! yay! yay! yay! the new action sounds fabulous...just reading your post gets me excited...thank you thank you! you and Morgan rock! wooohoo! bring on the action...hehe, I'm such a dork! Seriously, how in the WORLD can you improve on your original Perfect Portrait? I LOVE that action, and I can't wait to see what this new baby can do! Just started using some of your actions for my PSE 8!! They are lovely and so helpful! Thank you so much! Super excited for this action! Cannot wait for the new action!! You rock! Soooo generous! Wow! It is so refeshing to know there are those out there like you willing to share & spread knowledge. Hooray! It will be like Christmas in July!! I can't wait. I'm a portrait photog and your actions are such time savers and I love the layer masks so I can tweak them to my taste! Thanks!! First of all, i want to say thank you for all that of the freebies and advice!! I LOVE YOUR PAGE! I love Photography and EDITING...its like breathing...its a MUST lol. There are more links there of freebies too that are very COOL LOL.